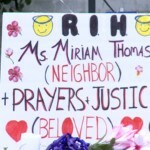 79 year old Miriam Thomas was a much loved neighbor. She was killed in a hit and run early Thursday morning. Residents of the Ridgecrest neighborhood in Montgomery say she was a pillar of the community. People who saw her often said she always kept the block clean. She was beautiful woman, sweet, loving, and always trying to help many people and giving back. She was a life-long educator, and her family is well known in Montgomery. Residents say they hope and pray that whoever is responsible will turn themselves in. The police have released video of a vehicle they believe hit Miriam Thomas. It appears to be a 1990’s to 2000 model small sedan in a light grey or silver color. If you have information that can lead to an arrest in this case, please call crimestoppers at 215-stop.